When my mom shared Vice's documentary about Charlottesville on Facebook, that's when I knew it had really broken through. She posted a link to Vice.com and said "For anyone that doesn't understand what's going on, here's a sad but pretty good explanation of it all!" Vice's 22-minute documentary, "Charlottesville: Race and Terror," came out on Monday night. It contained chilling footage of last Friday night's white nationalist march on the campus of the University of Virginia and Saturday's violent clashes in Charlottesville. Thanks to HBO, YouTube and major television networks, the footage has now been seen by tens of millions of people. Some, like my mom, have been introduced to the Vice brand for the first time. The documentary was a special episode of "Vice News Tonight," Vice's daily news program on HBO. The program launched last October as an immersive alternative to traditional broadcast and cable nightly newscasts. It has started to develop a fan base, but it attracts a significantly smaller audience than any of those programs. Josh Tyrangiel, the executive in charge of the program, decided to break with the program's usual format and devote the entire episode to correspondent Elle Reeve's reporting from Charlottesville. 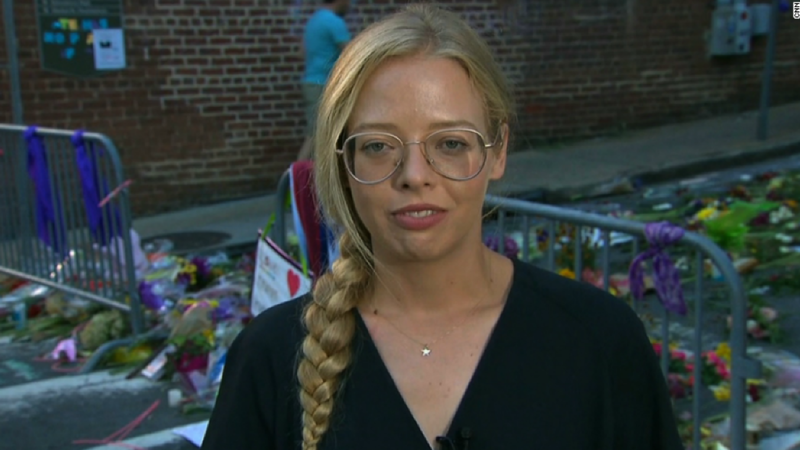 Tyrangiel said Reeve's past coverage helped her secure multiple interviews with some of the leaders of the protest, which attracted racists, neo-Nazis and KKK members. "The rise of white nationalism is a story that we've been covering," Tyrangiel said. "We've done a handful of pieces on it." So Reeve "has some credibility with those folks," he said, "in the sense that she knows who they are and she knows the distinctions between the groups. She knows what each one stands for and knows how to ask smart questions." In a telephone interview, he marveled at how Reeve and her crew managed to remain so calm and composed. The footage stood out because it was shot like a feature film -- but the characters are filled with racist and anti-semitic rage. The documentary's first scenes of Friday's torch-bearing rally were especially shocking. Local news crews and local residents had captured video of the protesters saying "You will not replace us" and "Jews will not replace us," but the Vice footage was more up-close and upsetting. By Sunday, Tyrangiel said, "I knew we had something pretty unique and pretty horrifying." The 22-minute documentary reached about 500,000 viewers when it first aired on HBO Monday evening, according to Nielsen. What happened next was pivotal. HBO gave the OK for Vice News to post the entire episode on its YouTube channel as soon as the TV airing was over. The episode was also available on HBO's on-demand platforms, but posting it on YouTube made it much more widely accessible. Tyrangiel and other Vice staffers shared the YouTube link on social media. It started to pick up attention on Tuesday morning. CNN and many other networks showed portions of it. "NBC Nightly News" used the video from Friday night's rally for a "fact-check" of President Trump's claim that some of the protesters were "very fine people." The protesters' hateful chants made the point better than any reporter could. In an interview on "Anderson Cooper 360" on Wednesday night, Reeve said the most striking thing about the white nationalist protest was "how well-organized it was." Cooper asked: "What are they so angry about?" "As ridiculous as it sounds, they feel like they are the ones that are truly oppressed," she said. Reeve also said some of the participants were hostile toward her. "They called me 'lügenpresse' -- that's a Nazi term for lying press," she said. Over the years, Vice has had more than its fair share of critics. But the reactions to the Charlottesville documentary have been almost universally positive. The actress Olivia Wilde called it "disturbing but necessary viewing." The New York Times Magazine reporter Nikole Hannah-Jones said it "chilled me to my core." The former Bush White House press secretary Ari Fleischer tweeted: "This is horrific to watch. I can't believe VICE got this access. There are NO good members of the Klan or the Nazis." Speaking on Wednesday, as the episode continued to gain external media awareness and social media views, Tyrangiel said it is the biggest breakout moment yet for "Vice News Tonight." HBO is trying to recover from a damaging hack of its computer systems this summer. The network has also been on the defense after its plans for a show called "Confederate," set in an alternate timeline of America where slavery continued in the south, caused backlash and calls for a boycott. Richard Plepler, the chairman and CEO of HBO, praised the "Vice News Tonight" production in an email message on Wednesday. The documentary was "invaluable journalism that held a mirror up to the despicable face of hatred, bigotry and racism," he said. "Sickening to watch, but necessary that we not forget that such vitriol still finds voice in our country and must be condemned and called out for what it is."